Whoa! Cool show coming on November 11, 2012, at the Mad Raven in Waltham, MA. 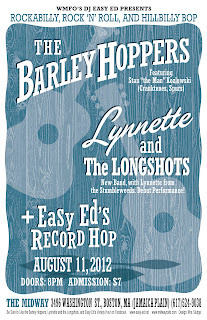 My good friends, and yours, the Barley Hoppers come north for three sets of rockabilly, rock 'n' roll, and hillbilly bop! I'll be spinning records when the band's on break, so the bop won't stop all night long. No cover! Thank you, Kathy Wade, for the cool poster design! 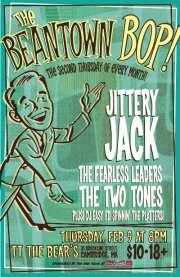 August 11, 2012, at the Midway in Jamaica Plain, join us for a great night of rockabilly, rock 'n' roll, and hillbilly bop. 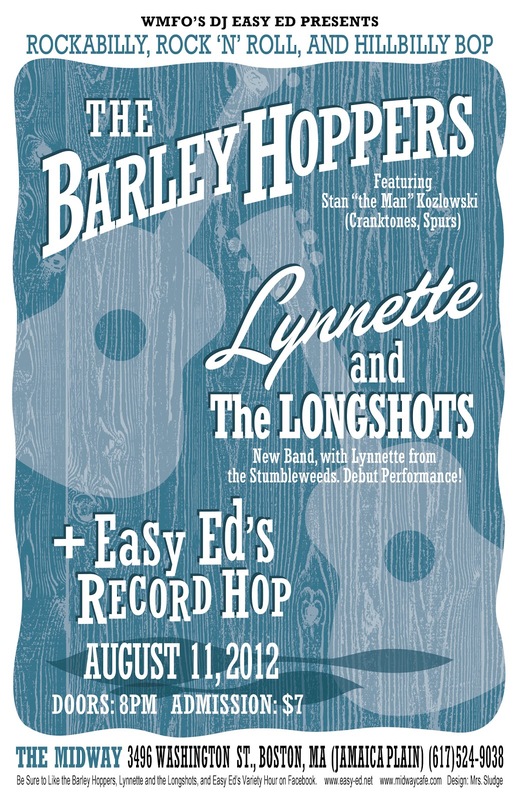 Lynnette and the Longshots--a brand new band, starring Stumbleweeds front lady Lynnette Lenker--will be the first band on and then we'll hand the stage over to The Barley Hoppers from Providence. I'll be spinning records to keep the dancefloor moving (early, late, and between bands). A good time is guaranteed. This will be a huge rockin' show--even in the middle of summer we have huge rockin' shows! 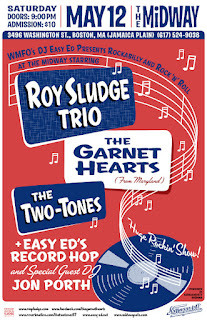 Come on down to the Midway on Saturday, May 12, for what will surely be a fantastic night of rockabilly and rock 'n' roll. The Two-Tones kick things off with a set of rockabilly/country numbers. These kids have talent to burn and we're really looking forward to having them on the bill. 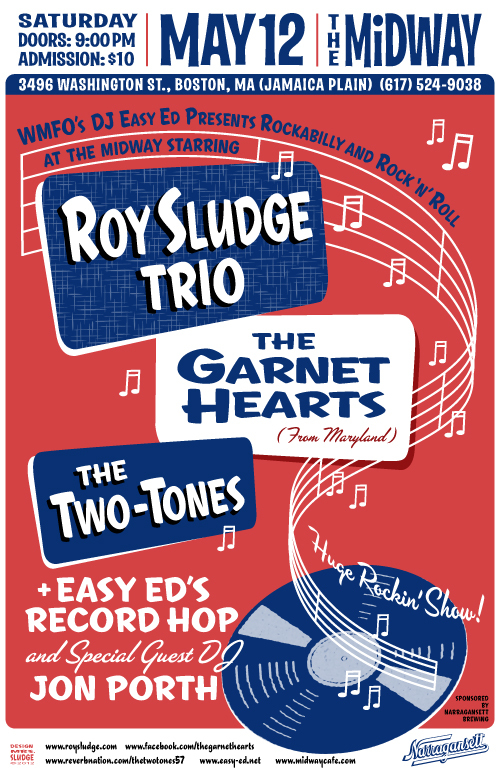 Atop the bill, top-notch drinkin', truckin', and rockin' with The Roy Sludge Trio--Allan Sheinfeld, Duke Levine, and Jim Haggerty. These guys are, quite simply, the best. 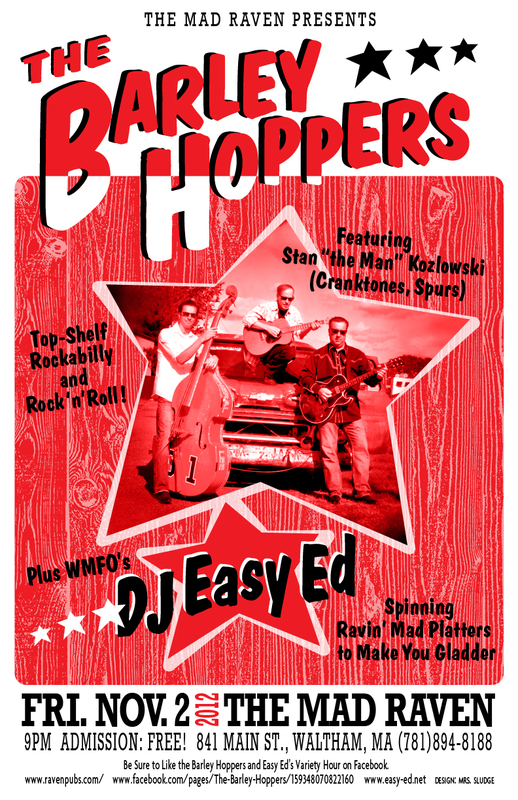 Check out their new album, "Too Drunk to Truck," and don't miss their triumphant return to the Midway on May 12. 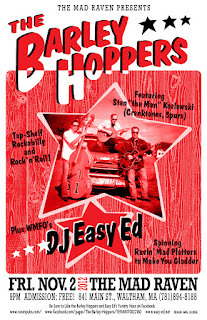 DJ Easy Ed and special guest DJ Jon Porth will be spinning rockabilly and rock 'n' roll early, late, and between bands. 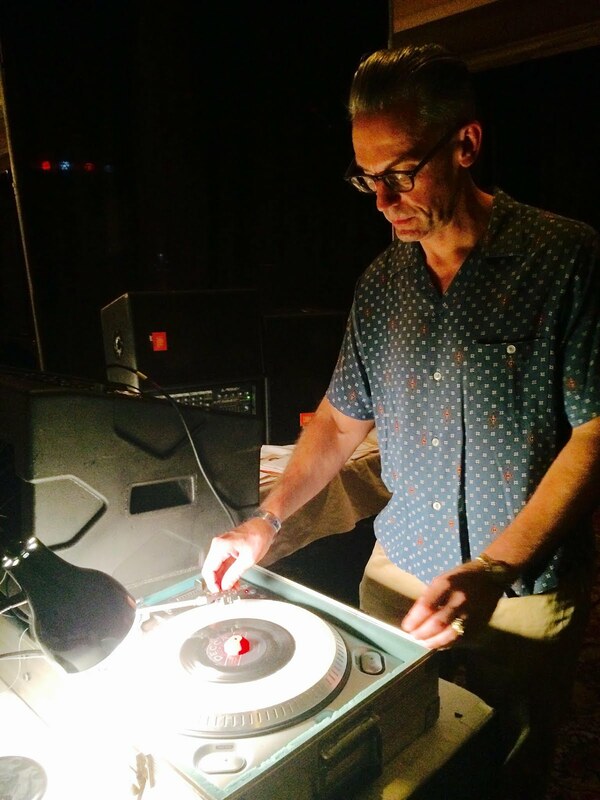 and DJ Easy Ed spinnin' the platters! Sponsored by the fine folks at Narragansett! Come on out and show your support for rockin’ music played live. It’s gonna be killer diller. Cool poster by Beck Rustic. 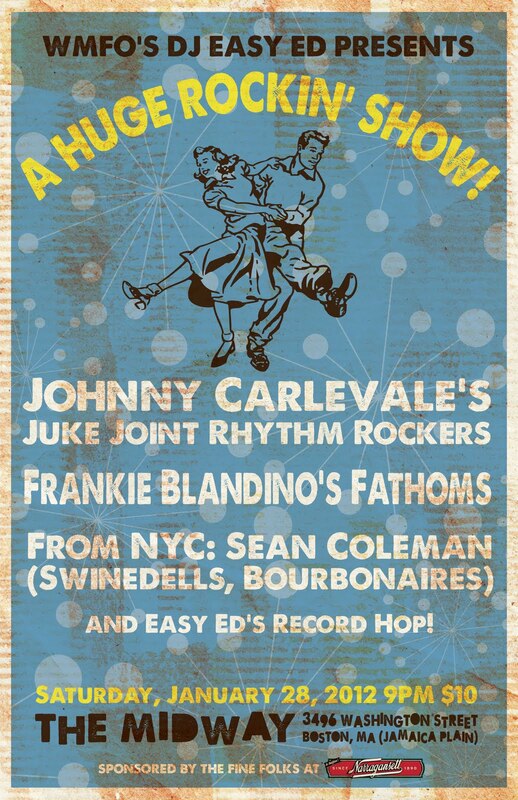 Tune in to Easy Ed's Variety Hour this Friday and catch an on-air set from Johnny Carlevale and the Juke Joint Rhythm Rockers. The broadcast runs from 6:00 to 8:00 PM; the band will be on around 7:00. This will most definitely be a Huge Rockin’ Show! 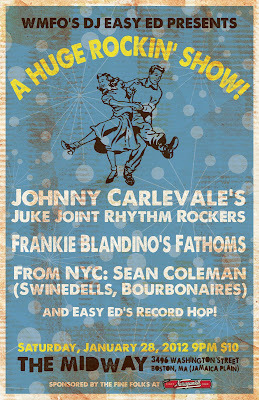 Starring Johnny Carlevale’s Juke Joint Rhythm Rockers; Frankie Blandino’s Fathoms; and, from NYC, Sean Coleman (Swinedells, Bourbonaires). 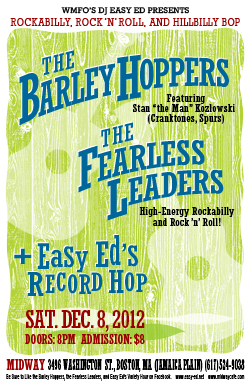 Plus Easy Ed’s Record Hop.